Not pictured: WORD, blisters, salvation by literature. Of the many ways to bond with strangers on a beautiful summer’s day, you can’t beat walking and talking for hours on end. 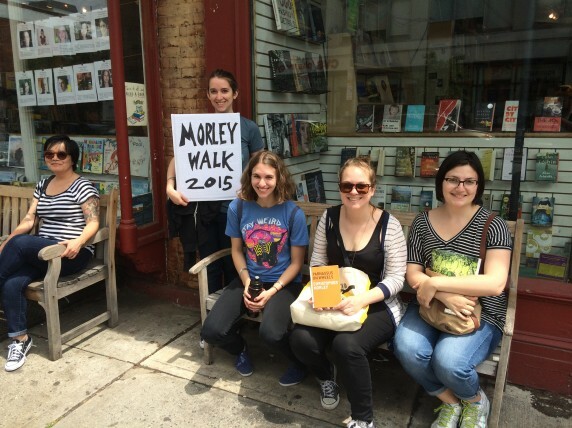 So Melville House and Book Riot (with the assistance of the East River Ferry) recently teamed up to do just that, and the end result was that on this past Saturday, a devoted group of readers participated in the second Morley Walk! Christopher Morley’s Brooklyn of the early 20th century may look fairly different than the Brooklyn of the current day, in that there are more coyotes now, but this was to our advantage. Our plan was to visit seven bookshops while also marathon reading out loud the text of Parnassus On Wheels, the sweet (and occasionally silly) tale of love and second chances that chronicles 39-year-old Helen McGill at the start of her unexpected second career as a bookseller and owner of the titular horse-drawn bookshop. But unlike Helen, we had only Shank’s mare (Google it) and a city-owned boat to bring us from bookstore to bookstore. 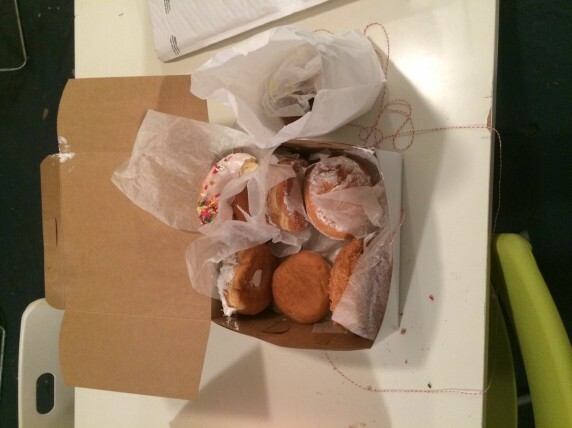 The early risers met at WORD in Greenpoint to scarf donuts from the Peter Pan Bakery. I ate three. This is not my personal record. 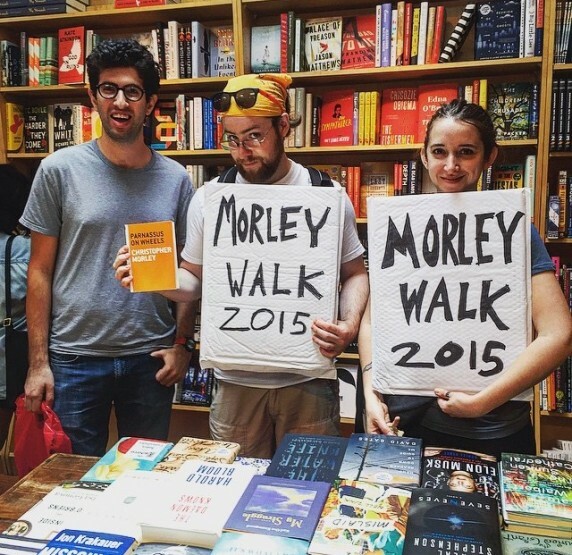 I was dressed in an outfit that was charitably referred to by one of our walkers as “literary mountain man” so that people could easily find me, and to that end we also carried large signs emblazoned with the slogan “MORLEY WALK 2015”. 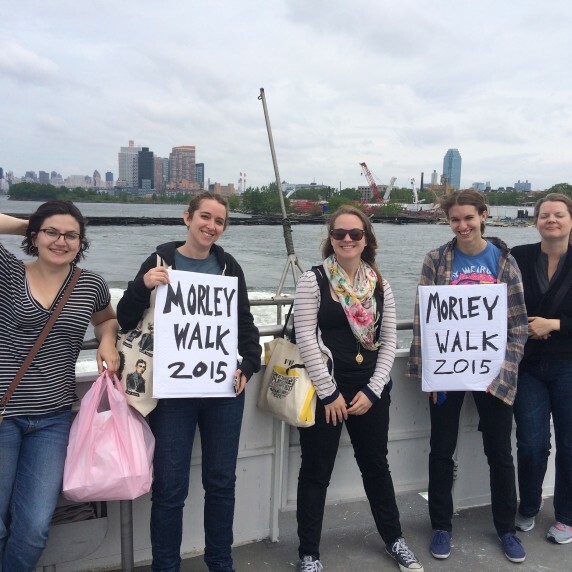 From WORD, it was a short walk to the East River Ferry, and as we walked our reading began! Parnassus On Wheels can be best described, certainly in its early chapters, as a picaresque. Jonathan Gibbs said it better than I ever could, but suffice to say we were immediately struck by Helen’s unflappable attitude in the face of increasingly trying and absurd circumstances: a layabout brother, suspicious sales tactics, and a dominant culture (reflected in many, many self-effacing asides) that didn’t view a 39-year-old single woman as someone worth noticing, let alone as a personality that could, say, anchor an entire novella. But anchor it she does! As we stepped onto the East River Ferry we paused our reading, both because reading out loud on a boat is really goddamn hard and also to take in the lovely scenery that a trip down the East River affords. 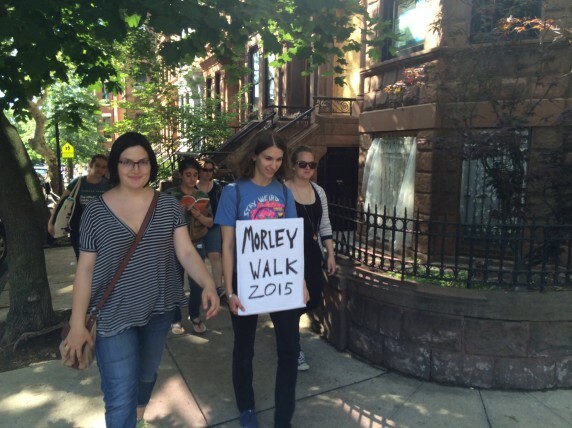 The one burned-out building that hasn’t yet been razed to build Patrick Bateman-worthy condos! Bridges! A brief glimpse (behind the gnarled power station) our very own office and bookstore! The ferry trip was brief because nobody was going to North Williamsburg because everybody in North Williamsburg was off taking drugs at Governor’s Ball. 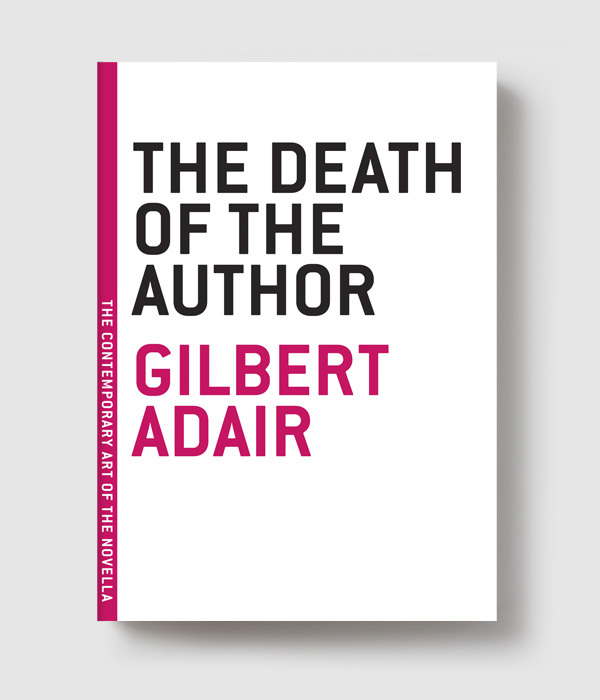 Upon disembarking, we resumed our reading, passing a copy of the novella from reader to reader. 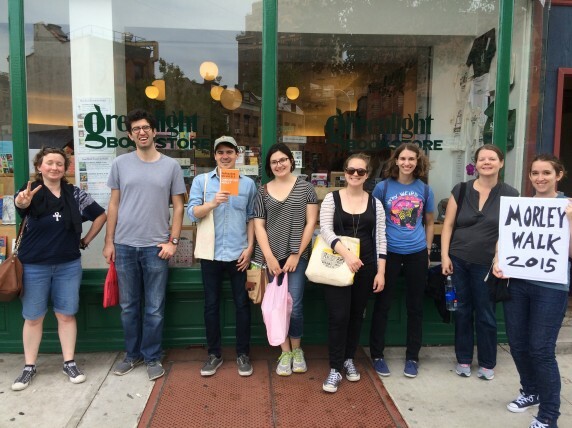 We transitioned from Helen’s snap decision to purchase a horse-drawn bookstore, into her crash course in bookselling courtesy of the Parnassus’ former owner Professor Roger Mifflin, and soon arrived at powerHouse Books. Despite my hopes, Karl Knausgaard wasn’t still there. 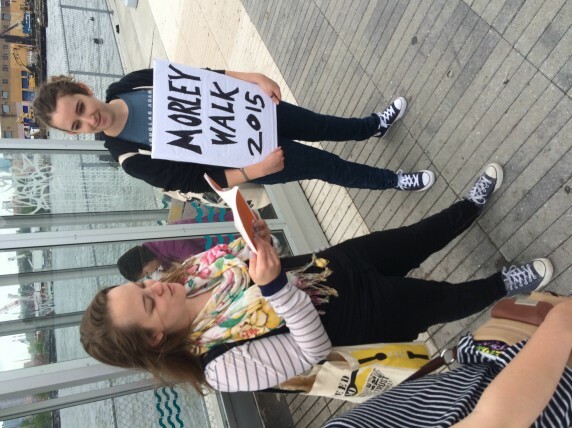 As we stopped for a breather and book-buying session, we were joined by a new walker. 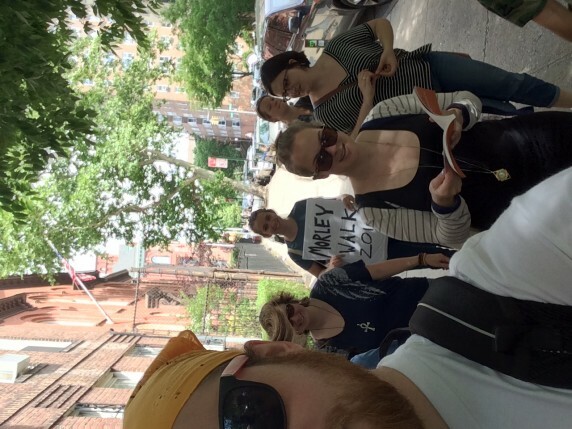 It was striking to me, as a fairly novice walking-tour/marathon-reading-leader, how many of the group were recent transplants to NYC; in one walker’s case, so recent as to have been living in Brooklyn less than a week! Which tells you something about the borough we call home; no matter how little money or connections you have, if you’re the kind of person who enjoys reading from a century-old novella while being taken to independent bookstores by an unfortunately dressed publishing professional nursing directions from a dying phone, you’ll be fine in Brooklyn. 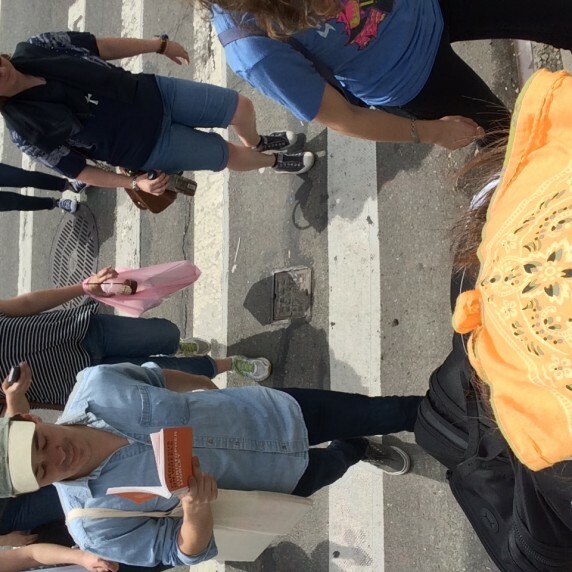 The trip from powerHouse to BookCourt took us through Cadmon Park Plaza, where we tried (vainly) to read aloud over the joyous strains of a parked car blasting “Drunk In Love” and a picnic blasting “Rolling In The Deep”. But since those are really good songs, we didn’t care. In fact, if you want to pull those songs up right now on Spotify while also turning on a sunlamp and imagining the occasional dopplered siren, you get a fairly good sense of the ambiance at this leg of the journey. It was getting hot, and I regretted not wearing sunscreen. But it’s hard to focus on skin care when you’re caught up in a story like Parnassus, which is why I burn so easily. It’s all about learning to be a small business owner and salesman! How American is that? About as American as “Drunk In Love”, which beats the hell out of “Star-Spangled Banner” both lyrically and musically. Additionally, Parnassus is punctuated with regular jokes, both intentional (Mifflin’s habit of using the oath “By the bones of ____”, rotating in various authors) and possibly unintentional (moments where Morley charmingly fumbles the voice and we’re reminded that he’s a dude). And everybody likes jokes. BookCourt was hopping, and we were all ready to duck into their air-conditioned space after traversing the concrete, treeless expanse of Court Street (motto: “Always Feels Longer Than Google Maps Makes You Think It Will”). At this point, it’s worth mentioning a few uncanny coincidences. 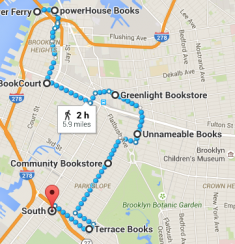 For instance, we would often reach the end of chapters right as we neared the next bookstore. As we ascended a hill, so would we read a description of the horse-drawn Parnassus struggling up a steep slope. Whenever I felt exceptionally thirsty, so would Helen narrate her own thirst as she drove the bookstore from town to town. It was weird, but in a good way, like when you realize that you and someone you just met have an uncannily high amount of mutual Facebook friends. “Heavenly city of content” indeed. 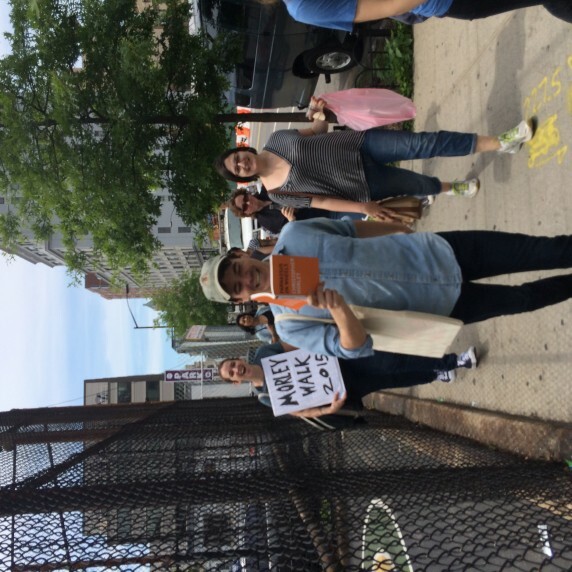 We were so overcome with appreciation for her enthusiasm that we barely noticed Maggie Gyllenhaal and her daughter browsing the discount carts of Unnameable Books. 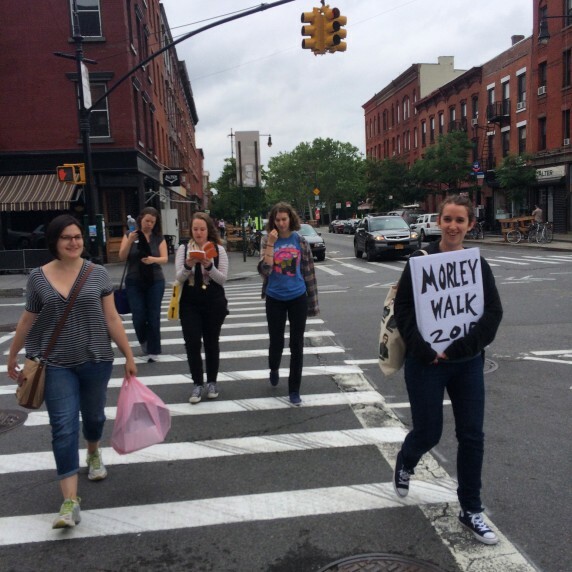 But we followed the NYC Celebrity Social Contract and gave her a wide berth, then wandered around Unnameable for ten minutes, and after picking up yet another new walker we proceeded on to the final stretch towards Community Bookstore. By now, the story had gathered yet more momentum. Mifflin and Helen’s brother, the literary wannabe Andrew, had just gotten into a massive fistfight, which left Helen (rightly) believing that both men kind of sucked at being grownups. As she set off on her own despite her apprehension, so did we enter Community to encounter something unexpected: a round of applause! 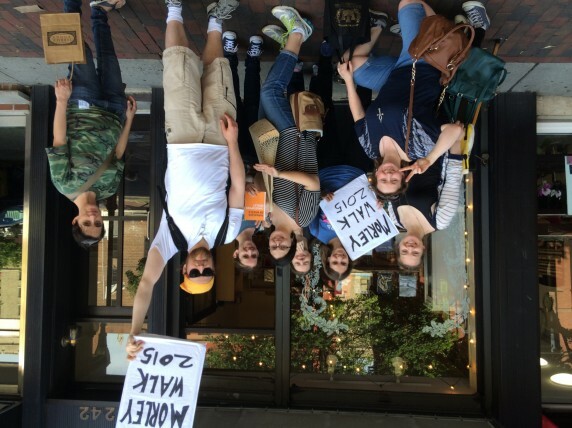 The booksellers had massed at the front of the store, and congratulated us on our soon-to-be-finished trek, offering us Arnold Palmers and cookies. I almost cried, but thankfully managed to keep it together, because I was dehydrated and I couldn’t afford the moisture. 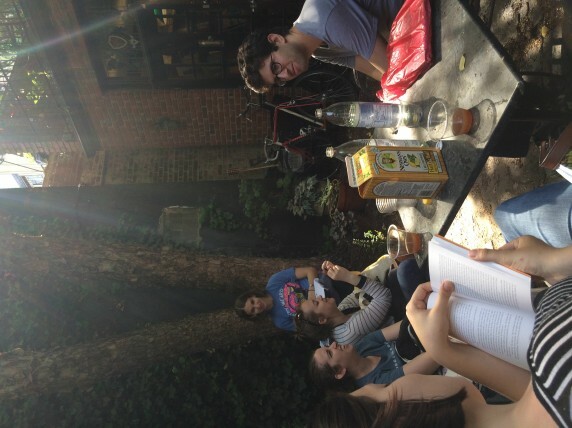 We made the collective decision to post up in Community’s back garden and make our way through a chapter ensconced in the shade. It was a really, really good call. 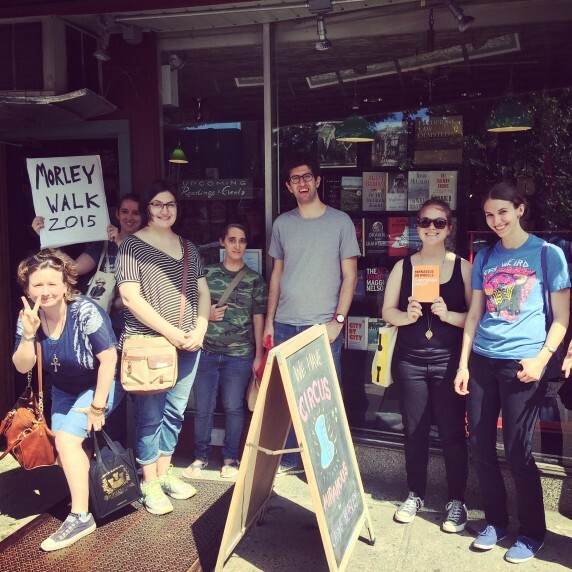 But we couldn’t stay there forever, so with just north of a mile left to go, we thanked our temporary hosts and set out south along Prospect Park towards our final bookstore, Terrace Books. It may be challenging to imagine, but as we made our way past that park on our left, bustling with families and festivities, and wound through herds of giggling children exiting the park and intermittent clouds of grill smoke, I realized that I couldn’t recall the last time I’d been this bound up in the out-loud reading of a single story. I asked if anyone else could, and they couldn’t either. We paused to reflect. How fitting that a summer Saturday would be the setting for a dip down the memory slide, back to days spent as children clustered around a teacher or other reader, all our signals and attention focused squarely on the narrative being spoken and unspooled before us. Terrace Books had a tub of beer on ice. We relaxed. After a beer or two, the small group that didn’t have to decamp to other obligations followed me to South on 5th Avenue (motto: “Does Rosie Schaap work tonight?”), where we took over a backyard table adjacent to a very boisterous and very Russian birthday party. It was there that we sailed through the three final, masterful chapters. Finished, we sat back, sipping our beers and munching up popcorn. Had it really only been seven hours? It felt as if we’d lived a lifetime in the book, bonded over foot pain and created a roster of injokes and our very own lingua franca. And yet we would likely scatter once we finished our drinks. Somewhere, someone played Vitamin C’s “Graduation”, if only in my dreams. 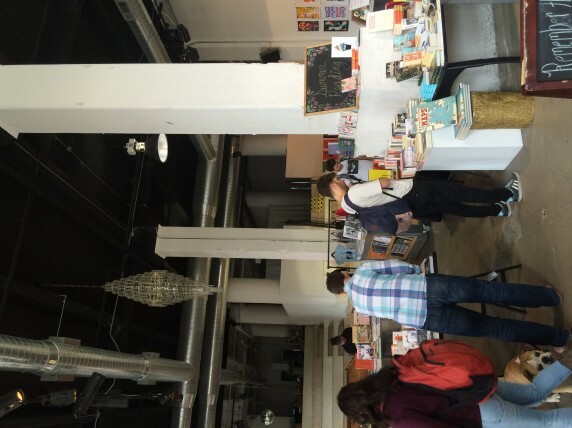 But in the end, the love you take is equal to the amount of time you spend visiting indie bookstores. 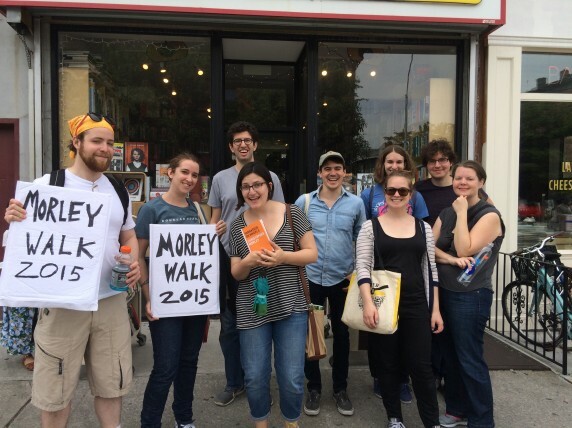 And though Melville House may publish two novellas by Christopher Morley, there aren’t just two reasons to walk/boat to seven bookstores in an afternoon. If you can do it, it leaves you with a similar sense of accomplishment and respectful exhaustion that one feels after consuming an entire book in a day. You may be tired, but your mind, and your spirit, are full. Now you’ve just got to make dinner. Alex reading, with my head in the way. Alex still reading. He did very well. 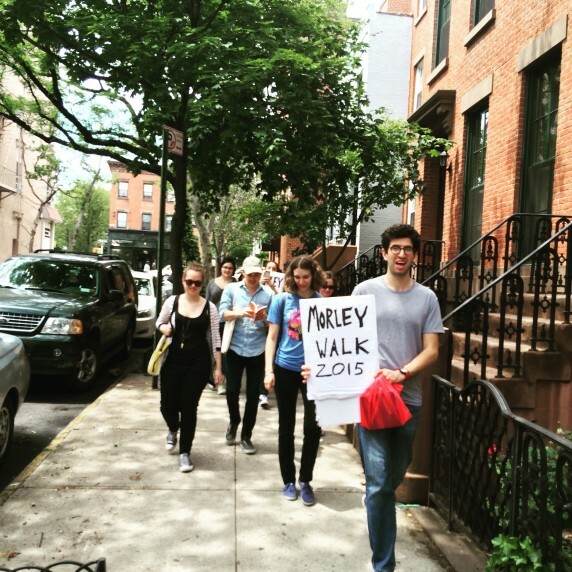 Runnin’ through the city with my books. Chillin’ in the Community garden.